Disk Utility is a drive diagnostics which can be used to test for defects or problems on a mac. It is located within the Utilities folder inside Applications. This utility is also available in rescue mode for testing the Mac HD boot drive. It’s best to contact Apple for more information related to accessing and using rescue mode. Please see Disk Utility User Guide for more information from Apple. Select an Operating System (OS) from the list above to display instructions for a specific OS. 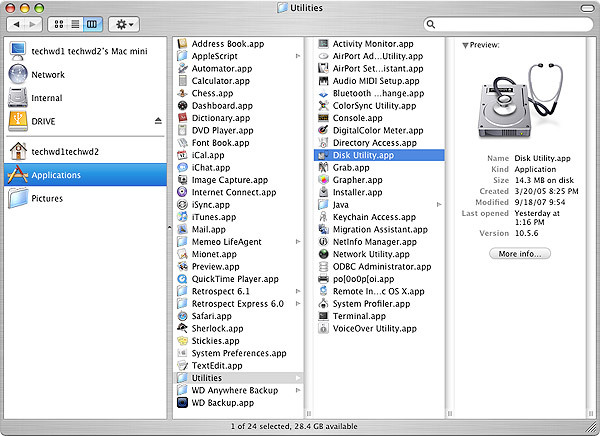 Locate and open Disk Utility from Utilities, within the Applications folder. Alternately, if the Finder is active in the Menu Bar, use the key combination Command+Shift+U to open the Utilities Folder. Click on Disk Utility. Click Verify Disk to check a drive or partition for errors but not repair them. Click Repair Disk to check a drive or partition for errors and attempt to repair any problems found. Click Verify Disk Permissions to check the permissions on a drive or partition but not repair any errors. Click Repair Disk Permissions to check the permissions on a drive or partition and attempt to repair any problems found. Only the Mac OS Extended (HPFS+) file system supports permissions. FAT32 (MS-DOS) does not support permissions. 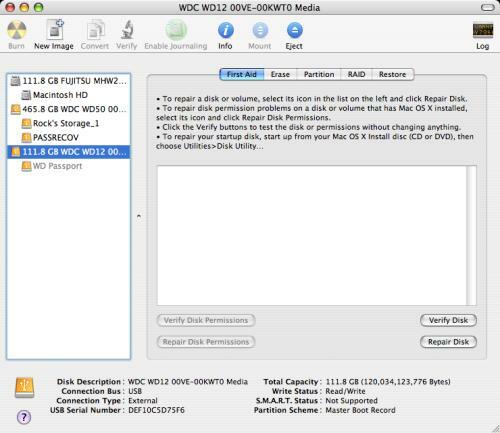 Locate and open Disk Utility from Utilities, within the Applications folder. Alternately, if the Finder is active in the Menu Bar; use the key combination Command+Shift+U to open the Utilities folder. Click on Disk Utility. Select the indented icon of the drive to be tested. 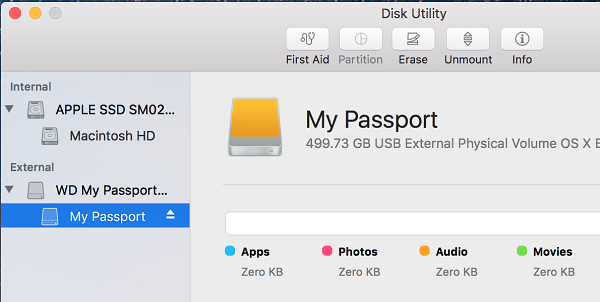 This is the data volume of the disk. Click First Aid from the tabs active tabs as seen below. A drop-down will appear prompting to confirm checking the volume for errors. Click Run. 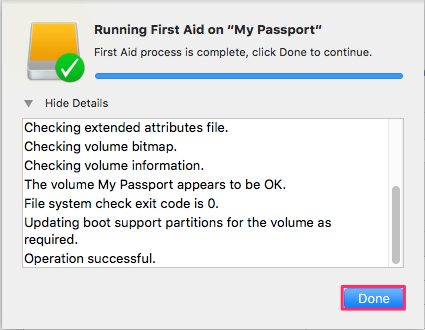 First Aid process will run several seconds to several minutes, depending on the amount of data on the drive, and any repairs to the file structure, data integrity, or permissions performed. Click the triangle icon to Show/Hide Details to view detailed information about the progress or any problems found.